The semester is proving to be much more writing-intensive than I had first imagined, but I want to write about something a little bit different. There’s an entire world of hockey out there. Did you know there are 4 ice hockey leagues in Mexico? There are 2 leagues in Thailand, 3 leagues in Turkey, 7 leagues in Poland, an international team in Kuwait, etc. The list goes on! In Canada, alone, there are over 200 registered ice hockey leagues, with almost 1300 teams! As important as the National Hockey League is to me, there is so much more hockey out in the world that I don’t think gets any attention. This could be because of a much lower skill level in the leagues, or because of the focus on another sport, mainly soccer/futbal. So I’m going to write a post, every once in a while, about a foreign league team, and title the section: A World of Hockey. So without further ado, here is Anyang Halla from South Korea. Anyang Halla was founded in December of 1994 in Anyang, South Korea. Their home arena is the Anyang Sports Complex in Anyang, and their colors are blue, gold, and white. Their home jerseys have a blue base color, while the away jerseys have a white base color. The team captain is 26-year-old, Korean-born defenceman, Kim Woo-young. The alternate captains are Korean-born defenceman, Kim Bum-jin and Canadian-born forward, Brock Radunske. As of now the head coaching position is vacant. This is due to the last head coach, Shim Eui-sik being fired in May of 2014 for “locker room related issues”. There are 23 players currently on the roster for Anyang Halla. Of those, 4 were born in another country, and 1 of those foreign-born players is now a naturalized Korean citizen. The ALIH is not well known for bringing in foreign talent, and I can understand why. If they are trying to improve the hockey programs in their own country, why would they want to bring in other people to take their jobs (as players on the ice)? That doesn’t mean they’re not interested, though, because bringing in good foreign talent will bring attention to the league, and, in turn, can help spread the game more around. While there have only been a handful of NHL players imported to play for Anyang Halla and the ALIH, the majority of imported players come from the Czech Republic and other lower-tier leagues in the world. The leading scorer from last season was Brock Radunske, who scored 65 points (29G 36A) in 40 games last season. Mike Testwuide cam in second in scoring with 54 points (27G 27A) in 42 games. The entire stats list from last season can be seen here. From 2003 to present (under the name Anyang Halla), the team has amassed a total record of 209-115-20-9, with 13 OT wins, 20 OT losses, 9 ties, 12 SO wins, and 13 SO losses. As the 2014-2015 season has started underway, Anyang Halla finds itself with a record of 2-3-1, good enough for 5th place in the league so far. The team gets its name from the owning body of it, the Halla Group, a South Korean business conglomerate. 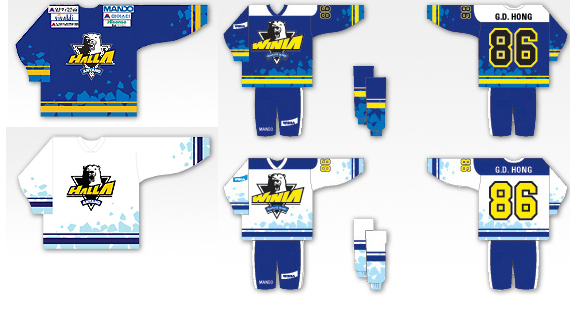 The company sponsors several hockey teams, including Anyang Halla and Kiekko-Vantaa, in a smaller Finnish league. Originally founded to help promote hockey in Korea, the team was originally named “Mando Winia”, named after a subsidiary company of the Halla Group, Mando. The team was known as “Mando Winia” from1994-1997. In 1998, the name was changed to “Halla Winia”, and stayed that way until 2004, where the name was changed to “Anyang Halla Winia”. Ultimately, in 2005, the name was changed to the present “Anyang Halla”. Before joining the Asia League Ice Hockey, from here on referred to as ALIH, Anyang Halla was a member of the Korea Ice Hockey League. In that league, Anyang Halla was one of 4 teams in the league, and were able to win the championship 5 times starting in 1998. In 2003, Anyang Halla was one of the founding member teams of the new league, the Asia League Ice Hockey. This new league arose because of the large amount of teams that folded in the Korea Ice Hockey League as well as the Japan Ice Hockey League. The leagues, essentially, decided to form together, along with a team from China in what they call “The Three Kingdoms on Ice”. As a member of the ALIH, Anyang Halla has won the championship twice, in 2010 and 2011. Anyang Halla is one of 3 total Korean teams in the ALIH. The other two are High1 and Daemyung Sangmu. Anyang Halla has one retired number, and that's #91 for Shim Eui-sik (the same head coach who was recently fired in May). In his entire playing career with Anyang Halla, Shim Eui-sik was the MVP of the Korean League 5 times, and held the record for most goals and points. More ALIH game highlights from last season can be found on this Youtube playlist. As of now, I'm having trouble finding ways to actively watch live streams of the games, so I can only go based off of highlight videos and standings updates. Any comments or suggestions for what teams to write about next? Let me know! Don't forget to follow my Twitter account @DTJ_AHockeyBlog for more articles! Thanks for reading. Yeah, I saw that as soon as I posted it. No worries though since the second link is an entire playlist! Really interesting post and I look forward to more from this "A World of Hockey" series. On the topic of Korean hockey, former Devils farmhand, Michael Swift has been playing with Gangwon High1 of the Asia League since 2011-12 after spending 2008-2011 with the AHL Devils. He even became a South Korean citizen and represented them in the most recent World Championship Division 1A. He's hoping to help them qualify for the 2018 Olympics in Pyeongchang, since despite being the host nation, they don't get automatic qualifying. They don't get automatic qualifying? I thought they did. Hmm, I'll have to look into it! I believe some Korean players came over to Canada a few months ago to help their training (presumably for the Olympic qualifiers). I appreciate the comment! If you want me to write about a certain (preferably foreign) team, please tell me! Yeah, I was confused at first when I read an article that mentioned they don't qualify automatically. Here is a NBC Sports article on it (http://olympictalk.nbcsports.com/2014/07/17/south-korea-hockey-2018-pyeongchang-olympics/). I don't have any specific requests. I'm interested in non-traditional hockey markets in general. I often find myself on sites like Elite Prospects looking at stats from all the various leagues in the world.